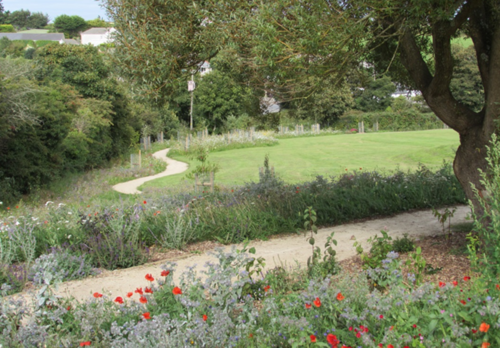 Wildflower Turf Ltd have recently been nominated as a key supplier by Cornwall Council as part of the council’s Green Infrastructure for Growth (GI4G) project. The Hampshire-based wildflower experts are assisting Cornwall Council and their incumbent contractors Cormac with the delivery of a far-reaching programme that will see £3.5 million invested in public recreational areas, roadside verges and old churchyards to make them better places for people and wildlife. Seven Cornish towns have been identified to receive investment through GI4G, with the environmental funding focus creating a nature-rich habitat across an area equivalent to 35 rugby pitches. In consultation with environmental specialists from Exeter University and with guidance supplied by the team from Wildflower Turf Ltd, Cornwall Council established a number of wildflower trial sites during late Summer/Autumn 2017. The germination and growth results were very convincing and both Wildflower Turf and Wildflower Earth™ products are now being used across the various sites nominated by the Council, who have worked in close consultation with local communities to identify areas to benefit from this urban green space investment. The Green Infrastructure for Growth Project is supported by funding from the European Regional Development Fund, Cornwall Council, and the University of Exeter. Wildflower Turf is recognised as the leading organisation in the UK for those seeking knowledge or products to develop wildflower spaces. Founded in 2003, Wildflower Turf Ltd pioneered a soil-less growing system which has transformed the reliability of establishing wildflower meadows. The company has a range of Wildflower Turf products to create and enhance a low maintenance, biodiverse and beautiful meadow. The GI4G project is receiving £2,802,109 of funding from the England European Regional Development Fund as part of the European Structural and Investment Funds Growth Programme 2014-2020. The Department for Communities and Local Government (and in London the intermediate body Greater London Authority) is the Managing Authority for European Regional Development Fund. Funding has been secured for a £3.5 million project, led by Cornwall Council, to deliver a major investment in the urban green spaces of the towns of Camborne, Pool, Redruth, Penzance, Bude, Saltash and Hayle, making them better places for people and for wildlife and more accessible for all. This press release was distributed by ResponseSource Press Release Wire on behalf of Wildflower Turf Ltd in the following categories: Environment & Nature, Farming & Animals, Public Sector, Third Sector & Legal, for more information visit https://pressreleasewire.responsesource.com/about.